Kate Lyn Sheil is an amazing actress and she continues to impress in Lost Holiday, a buddy-comedy-gone-wrong from Michael and Thomas Matthews. Sheil stars as Margaret, a young woman who returns home to Washington DC with her best friend Henry (Thomas Matthews) to spend the holidays with friends. While at the party of an old high school buddy, Margaret sees her ex-boyfriend and meets his new fiancé, a blow that quickly sours her mood. Henry and Margaret ditch the party in search of a better time and end up looking for drugs, a search that takes them to the home of a local drug dealer/adult movie director. The pair's night of celebration goes from bad to good to worse when Margaret and Henry discover that a local socialite disappears and is believed to have been kidnapped. For reasons which make sense only to her (and anyone paying close attention), Margaret becomes convinced that she is the only one who can solve the mystery of the missing socialite and Henry tags along because he has nothing better to do, and perhaps a little because he's concerned his friend has gone crazy from the grief of seeing her ex moving on without her. The opening act of Lost Holiday is annoying. These people are clearly not fully in touch with reality and there's a sense of entitlement which is off-putting but Sheil is completely engrossing from the opening moments and so I found myself going along with the story for her. Thankfully, once the pair go looking for drugs, the movie picks up a bit of steam before devolving into a rambunctious and completely entertaining comedy of errors. The Matthews' brilliantly shift gears a few times throughout the movie and Lost Holiday turns from a tale of personal disappointment into a somewhat comedic search for a missing woman which takes the wanna-be detectives from a drug den to a recording studio before ending up near a storm sewer where the entire movie culminates into a hilarious scene involving a portable toilet. Except there's still twenty minutes left in the movie. What next? Lost Holiday starts a little rocky but quickly finds its footing, delivering a fun, low-key comedy that never quite skews into stupidity, just gross incompetence. 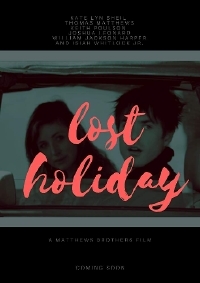 Sheil and Matthews have great chemistry and though it seems like a slight little movie, Lost Holiday does turn out, at its core, to be a meaningful story of friendship. Lost Holiday premiered at Slamdance and plays again on Wednesday, January 30.